Writing Our Story: Planning an "Under the Sea Mermaid Party"
Planning an "Under the Sea Mermaid Party"
I can not believe it is already AUGUST!!! What does August mean? 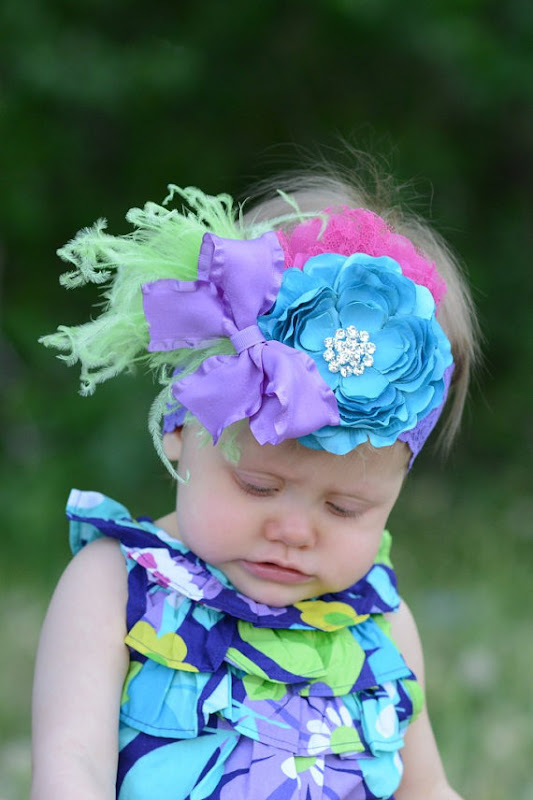 It means that on AUGUST 26th my little princess is turning ONE! 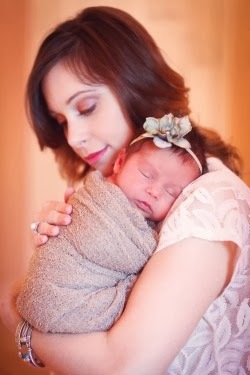 It seems like just yesterday that Josselyn made her grand entrance into the world. Well, her 1st birthday has definitely brought about some mixed emotions for Mommy. I have definitely shed a few tears (even Sunday on the way to church) but on the flip side I am having a total BLAST planing Josselyn's 1st BIRTHDAY BASH! 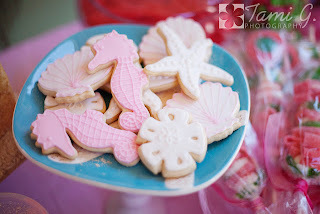 So let me share with you some of the ideas, pictures, etc that have inspired me along the way, as I have been planning Josselyn's very own UNDER THE SEA MERMAID PARTY. I love the live Betta fish!!! 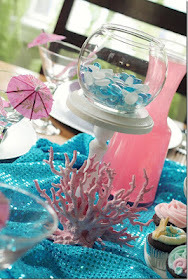 Next, I wanted to find some cute ideas for a fabulous under the sea "candy buffet". 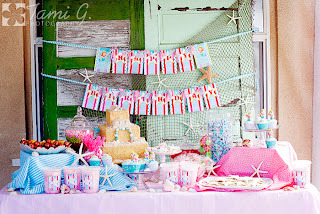 After lots of browsing on the internet I basically came to the conclusion that I am going to make sure all the candy for the candy bar matches the party colors which are purple, aqua, blue & sea green. I also decided that I want to put ribbon and tags around the glass jars so they look more uniform (like in the second photo below). 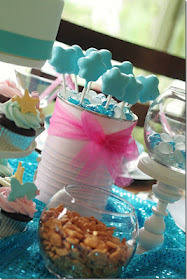 I can't wait to create Josselyn's candy bar! I love how the colors go with the theme! I love how they tied ribbon around the jars & stuck on tags! Gorgeous colors & I love the pretzels! You can not have a party without good food! I knew I wanted to keep the food KID FRIENDLY since this is a 1 year old's birthday party but once again I wanted to make sure it went along with our under the sea mermaid theme. 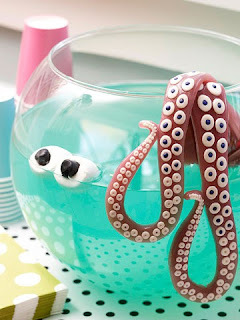 I searched for a variety of fun, simple appetizers & finger foods and then I tried to come up with creative "under the sea" names for the dishes. Here are some of the great ideas I came across. limbo, sand pales & messages in a bottle!!! Speaking of the beach...I must mention one of my favorite things I found online. 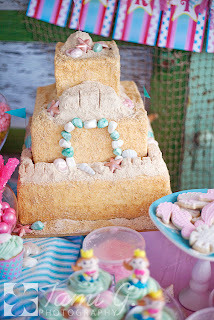 In my search for mermaid party ideas I stumbled across a couple parties that displayed card board sand castles. I love love love these adorable DIY sand castles for decoration. 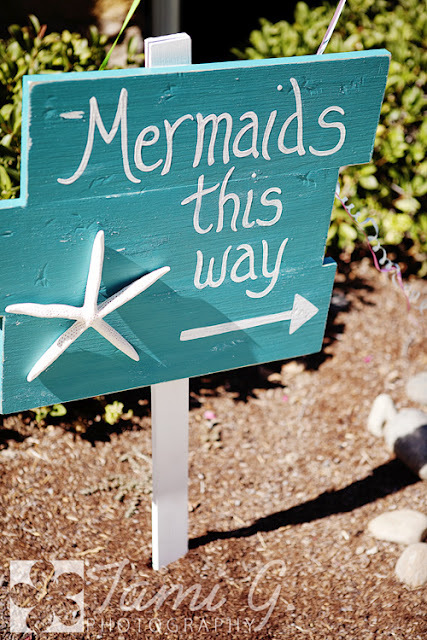 On my mermaid quest I found more than enough cute decoration ideas. 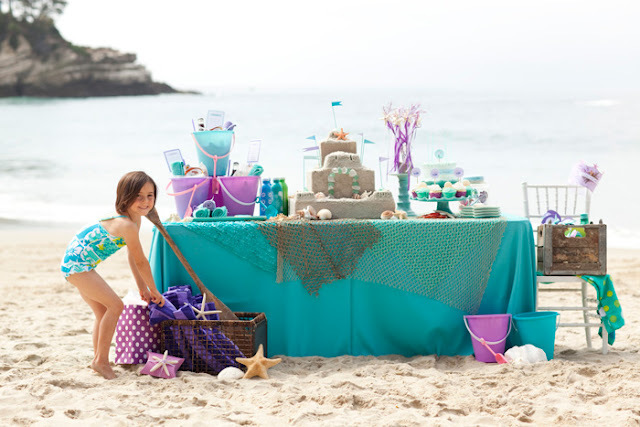 I love the use of sequin material as table cloths, I love the idea of putting gold fish crackers in fish bowls & I love the "Mermaids this way" sign! These are the invitations I chose!!! 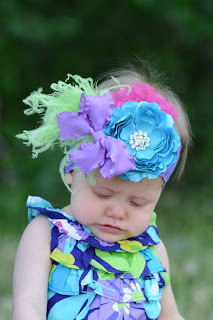 The Birthday girl's outfit is just as important as the party itself! Unfortunately I am still not 100% sure what my littler mermaid Josselyn is going to wear for the party (I do have her swim suit though!) I am trying to decide between a lace romper or a tutu/pettiskirt....We shall see! *Click here for pictures from Josselyn's Party An Under the Sea Mermaid Party!